Since allowing scooters back on its streets in October, San Francisco has found that while locks have greatly decreased complaints of sidewalk vehicle littering, the two companies with permits to operate have also signed up few customers to their low-income rider program. 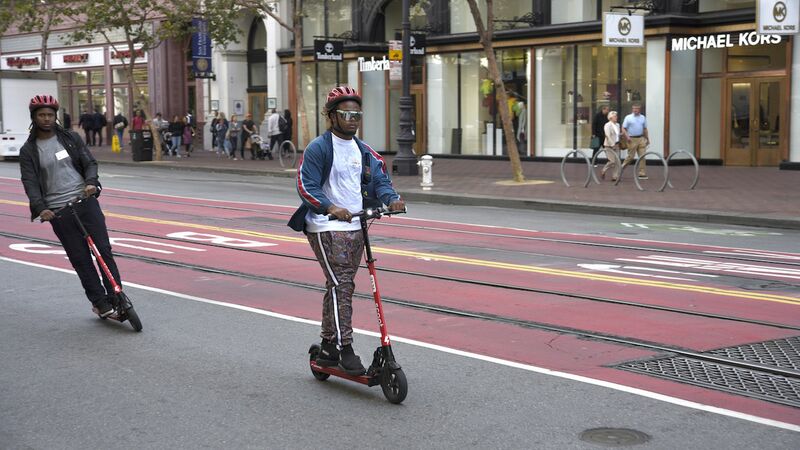 The bottom line: San Francisco’s transportation agency said on Monday, ahead of a board of directors meeting scheduled for the next day, that it will let Skip and Scoot each add 175 scooters if each signs up 150 users for their low-income program. They’ll be able to double their current fleets (to 2,500 total) if they reach 500 signups. Of the nearly 250,000 trips from mid-October through February, 90% were on Skip scooters and 10% on Scoot. 70% of trips were less than two miles in length, 75% lasted under 25 minutes, 42% replaced car trips, and most were clustered in the downtown area of the city. Complaints (693) and citations (166) have significantly declined compared to when three companies operated last spring without permits in the city. Yes, but: The companies are still short on some of initiatives they pitched as part of their permit applications last year. Scoot said it would deploy helmets in lockable boxes but has yet to do so (a spokesperson says the firm is “working through a design that we will deploy in the future"). Skip said it would assemble a community advisory board, but has yet to do so. That's in part because the process got stalled by conversations in January about a plan for both companies and the city’s transportation agency to team up to create one, according to a company spokesperson.